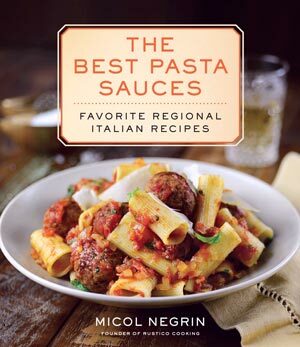 Buy Micol's third cookbook, The Best Pasta Sauces: Favorite Regional Italian Recipes, released by Ballantine Books (a division of Random House) in October 2014. Pasta... somehow I never tire of pasta. So many shapes, so many sauces, so many possibilities. And fresh pasta is even more enticing: there's the enjoyment of eating it, of course... but before that, there's the sensual pleasure of making it from scratch, the artistry and creativity in the kitchen that transforms a humble mass of flour into a beguiling dish worthy of the most sophisticated palates. 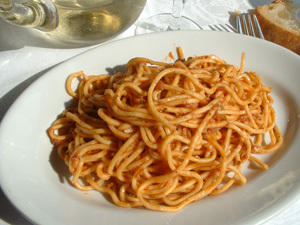 There are as many pasta dishes in Italy as there are cooks. Bold, subtle, herb-laced, or creamy, the sauces vary from city to city and region to region. The pasta shapes too change: there are long pastas, stout pastas, tubular pastas, pastas with pronounced ridges, others with nooks and crannies... I love the endless possibilities of pasta, the way something so simple can be so satisfying. 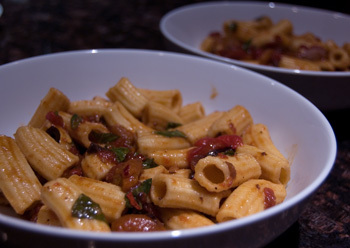 I invite you to explore this page and enjoy my favorite pasta recipes. You'll also find a step-by-step recipe for fresh lasagna, a how-to of homemade cannelloni, and dozens of useful pasta cooking tips. The sauce here is my mother's, and it is best served without any grated Parmigiano; but if you must use cheese, I sggest grated Ricotta Salata, which won't overwhelm the sauce. Cut the yellow and red peppers in half, seed them and place them, cut side down, on an aluminum foil-lined baking sheet. Broil until the skin is blackened and blistered, about 12 minutes. Remove from the oven, wrap in the foil and cool to room temperature. 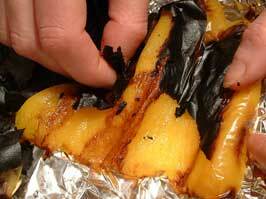 Unwrap, then slip off the peel and cut into long, thin strips. Heat 1 tablespoon of the olive oil in a 2-quart saucepan over a medium flame and add the garlic; cook 1 minute, or as long as needed for the garlic to lose its raw scent. Stir in the roasted peppers, olives, and tomatoes; season with ¼ teaspoon of the salt. Bring to a boil. Lower the heat to a simmer; cover; cook 30 minutes. Fold in the basil and keep warm. Meanwhile, bring 5 quarts of water to a boil. Add the rigatoni and the remaining 2 tablespoons of salt. Cook until al dente, then drain, reserving ½ cup of the pasta cooking water. 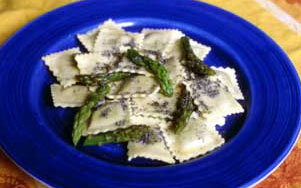 The contrast between the emerald asparagus and the black poppy seeds is striking atop the ravioli. If you can't find Ricotta Salata, substitute Pecorino Romano. For a step-by-step on making ravioli, click here. 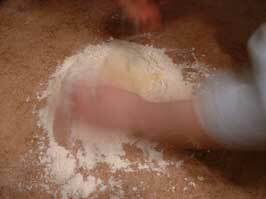 Make the dough: Mix the flour and salt on a counter and shape into a mound. Make a well in the center and add the eggs and water to the well. Using your fingertips, work the flour into the egg, then gather into a dough and knead by hand; add a little water if the dough is too dry or a little flour if it is too moist. 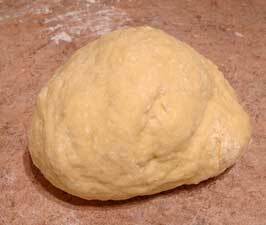 Knead for 10 minutes, or until smooth, then shape into a ball, wrap in plastic, and let rest 30 minutes. 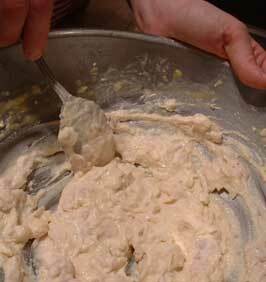 Meanwhile, make the filling: Combine all the ingredients in a bowl and beat thoroughly with a fork until smooth. Do not use a food processor or the filling will liquefy. Assemble the ravioli: Cut the dough into 2 pieces. Working with 1 piece at a time and keeping the other covered, roll each piece out into a thin sheet using a pasta machine; the sheets should be nearly transparent after rolling. Brush one sheet with a bit of water and spoon on teaspoons of filling about 1 inch apart. Lay the second sheet on top and press gently to seal the edges and to squeeze out any air pockets between the mounds of filling. Spread the ravioli out on a lightly floured baking sheet in a single layer and refrigerate until needed (up to 24 hours), covered with a clean, dry towel. You should have about 48 ravioli. Make the sauce: Melt the butter in a 12-inch sauté pan over medium heat until lightly browned. 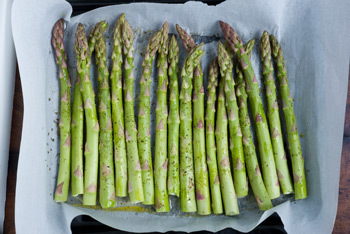 Add the asparagus tips and ½ cup of water, season with ¼ teaspoon of the salt, and cook 5 minutes, or until the water evaporates and the asparagus tips soften and brown lightly. Sprinkle in the poppy seeds and cook 30 seconds to bring out their aroma. Remove from the heat. This first course is a delicate mingling of thin ribbons of pasta tossed with rock shrimp, lemon zest, and a handful of baby arugula; no need for any tomatoes here to mask the subtle flavors of this seafood sauce. Bring 4 quarts of water to a boil. Add the linguine and 2 tablespoons of the salt and cook until al dente, about 8 minutes. Drain, reserving ½ cup of the pasta cooking water. Heat 2 tablespoons of the olive oil in a 12-inch skillet. Add the garlic and cook 30 seconds over medium-high heat. Add the shrimp and cook until the shrimp turns pink and opaque, about 2 minutes. Season with the remaining ½ teaspoon of salt and the pepper, pour in the cream, and cook 1 minute to reduce the cream to a coating consistency. 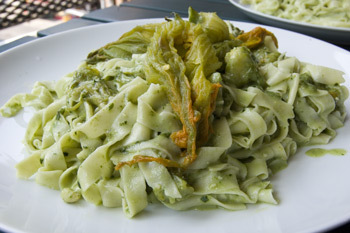 Summertime brings a bounty of zucchini, and with it delicate, flavorful zucchini blossoms. If you've never tried cooking zucchini blossoms, this is a great recipe to start you off. 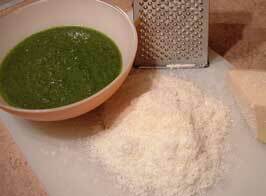 Make the pesto: Place the basil, pine nuts, garlic, and salt in a food processor. Gradually pour in the olive oil with the motor running; the mixture will emulsify. Make the zucchini blossoms: Trim the long stems off the zucchini blossoms. Remove the thin orange pistil in the middle of each blossoms (take care not to destroy the blossom as you do so; gently open the blossom to remove the pistil). Gently rinse the petals under a light spray of cool water. Be sure to open the blossoms when rinsing, since small insects tend to hide inside the blossoms. Lay the washed blossoms on a double layer of paper towels to dry for a while. Check again to make sure there are no insects hiding inside. Heat the olive oil with the garlic in a 10-inch skillet over a medium flame for 1 minute. When the garlic is fragrant, add the zucchini blossoms. Cook, stirring once in a while, until the blossoms soften and become limp, about 10 minutes. Season with salt and remove from the heat. When you are ready to serve, bring 5 quarts of water to a boil. Add the tagliatelle and salt, and cook until al dente, reserving 1 cup of the pasta cooking water. 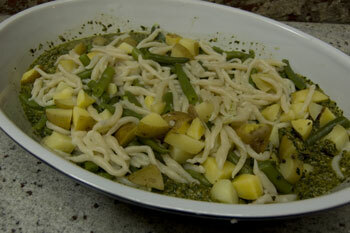 Dilute the pesto in the serving bowl with the reserved pasta cooking water. I prefer spicy Italian sausage with fennel seeds in this robust pasta sauce, but a mild sausage works well too. 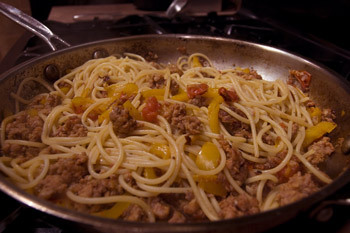 Heat 1 teaspoon of the olive oil in a deep 14-inch skillet over a medium flame and add the sausage (the skillet should be deep enough to accommodate the spaghetti later). Cook, stirring often to break up the sausage, until the sausage takes on a little color, about 10 minutes, being careful not to burn it. Stir in the garlic and peppers, and sauté until the peppers are wilted, about 10 minutes. Add the tomatoes and ½ teaspoon of the salt. Cook 10 minutes, stirring often. Meanwhile, bring 5 quarts of water to a boil. Add the spaghetti and the remaining 2 tablespoons of salt and cook the spaghetti until al dente; drain, reserving 1 cup of the pasta cooking water. Toss the spaghetti in the skillet with the sauce and ¼ cup of the Pecorino, dilute with some of the reserved pasta cooking water as needed, and transfer to a heated serving dish. You can make the gnocchi up to 12 hours ahead, spread them out in a single layer on a floured tray, cover them with a towel, and refrigerate them until needed. Alternately, you can place the tray of gnocchi directly in the freezer and freeze the gnocchi until they are solid, then store them in freezer-safe bags for up to 1 month; do not defrost frozen gnocchi before boiling. This is a signature dish from Maurizia Brandolini, owner of Pastificio Dasso in Rapallo, a famous pasta shop devoted to classic Ligurian pastas. 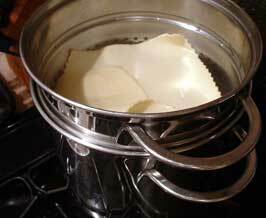 Make the Parmigiano baskets: Preheat the oven to 425 degrees. Line an 11-inch x 17-inch baking sheet with a silpat liner (a non-stick silicone liner; available in kitchenware shops). Sprinkle the Parmigiano on the silpat, making 4 distinct circles each measuring about 5 inches in diameter, leaving about 1 inch between the mounds. Bake in the preheated oven until the Parmigiano Reggiano melts and forms 4 lacy pancakes, about 10 minutes; the edges should be barely golden. Meanwhile, invert 4 small round ramekins on a counter and place 2 spatulas near the ramekins. As soon as you remove the melted Parmigiano pancakes from the oven, drape each hot pancake over a ramekin, using the two spatulas and working quickly. 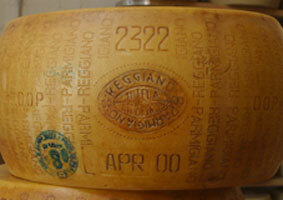 When the Parmigiano baskets have cooled to room temperature, remove each to a plate. Make the gnocchi: Place the potatoes in a 4-quart pot and cover with cold water. Bring to a boil and cook until tender, about 30 minutes. Drain, peel, pass through a ricer onto a counter, and cool to room temperature. Add the spinach to the riced potatoes and mix well. Add the flour, Parmigiano, nutmeg, and salt (and egg if using) and knead until smooth, adding a little flour if the dough is sticky. (Test the gnocchi by dropping a few in boiling water before shaping all the dough; add more flour if the gnocchi are too wet, but be careful: the more flour you add, the heavier the gnocchi will be). Roll into 10 logs, cut each log into 1-inch pieces, and toss with flour on a baking sheet. Make the sauce: Melt the butter in a 1-quart pot over a medium flame. Add the shallot and parsley and sauté 5 minutes, or until soft and translucent. Add the Gorgonzola, goat cheese, and cream, and cook, stirring constantly, until the cheeses melt and the ingredients form a rich, thick sauce. Keep warm. When you are ready to cook the gnocchi, bring 8 quarts of water to a boil. Add the 2 tablespoons of salt. Drop in the gnocchi and cook until they float to the surface, about 1 minute; remove with a slotted spoon to a bowl. Keep in mind that even when Italians call a dish "spicy," it is rarely truly hot; an authentic arrabbiata is lightly spicy, not searingly hot. Heat 1 tablespoon of the olive oil in a 14-inch skillet over medium-high heat. Add the garlic, chili, and parsley, and cook 30 seconds, or until aromatic. Fold in the tomatoes and 1/2 teaspoon of the salt. Cook over medium heat 20 minutes, covered, stirring once in a while. Meanwhile, bring 5 quarts of water to a boil. Add the spaghetti and the remaining 2 tablespoons of salt. Cook until al dente, then drain, reserving 3/4 cup of the pasta cooking water. 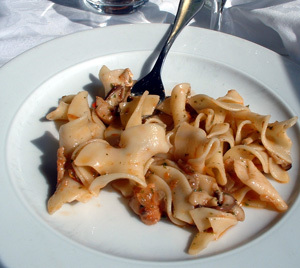 Fresh pasta is best here, but short dried pasta such as farfalle (bowties) works well too. Heat 1 tablespoon of the olive oil in a 14-inch skillet over a medium flame. Add the garlic, leek, mushrooms, parsley, and thyme, and cook 10 minutes, or until the leek and mushrooms are soft. Stir in the tomatoes, 1/2 teaspoon of the salt, the pepper, and the wine. Bring to a gentle boil and cook 3 minutes, then cover and cook for 15 to 20 minutes, or until the tomatoes have formed a rich sauce and the liquid in the pan has reduced a bit. Meanwhile, bring 5 quarts of water to a boil. Drop in the pasta and the remaining 2 tablespoons of salt. 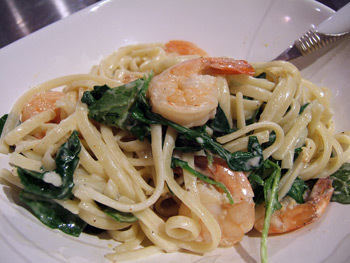 Cook until al dente, about 2 minutes, then drain, reserving 1/2 cup of the pasta cooking water. Trofie are short, curled gnocchetti (small gnocchi) typical of the Ligurian Riviera; they can be made with all-purpose flour or chestnut flour, with or without the addition of pureed spinach, or even of mashed potatoes and flour. This first course is embellished in classic Ligurian style, by cooking potatoes and haricots verts (thin string beans) in the boiling water along with the trofie. Make the pesto: Process the pine nuts to a paste in a food processor with the basil, garlic, and ½ teaspoon of the salt. Gradually pour in the olive oil with the motor running; the mixture will emulsify. Make the trofie: Place the flour on a counter and make a well in the center. Add about 2/3 cup of hot water to the well and start drawing the flour into the water in the well, little by little, with your fingertips. Add a little more water as needed to make a firm dough that holds together. Knead vigorously until smooth, about 5 minutes, adding more water if the dough is too dry and more flour if the dough is sticky. Keeping the rest of the dough covered while you work, take a walnut-sized piece of dough and roll into a thin log (as thick as a pencil). Cut into pea-sized pieces. Now comes the tricky part: Place one piece of dough on an unfloured counter and place your index and middle fingers over the piece of dough. 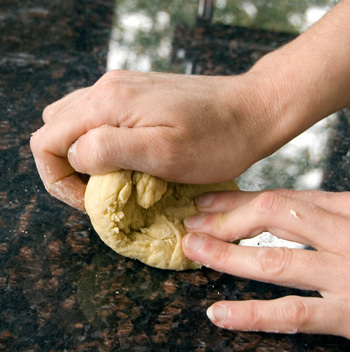 Quickly push the dough away from you on the counter, rubbing it against the counter as you do so. Then pull the dough down towards you with a slight diagonal motion. The dough should thin out, twist slightly in the middle, and taper on the ends. 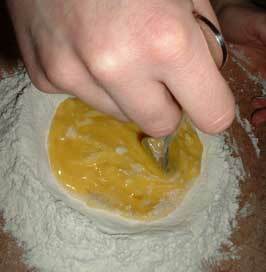 Continue in this manner until all the dough is shaped, dusting the trofie with semolina flour to prevent sticking. Place on a large tray and shake well to prevent sticking. When you are ready to cook, bring 5 quarts of water to a boil. Add the salt and potato, and cook 5 minutes. Add the haricots verts and trofie, and cook until the trofie are al dente, about 7 more minutes. Drain, reserving 1 cup of the pasta cooking water. Scallions make a perfect, if slightly more pungent, alternative to the leeks; use 1 and 1/2 pounds of scallions (about 6 bunches) instead. If you can't find garganelli (a lovely quill-shaped pasta from Emilia-Romagna), use penne rigate or another short, tubular pasta. Melt the butter in a 12-inch sauté pan over medium heat. 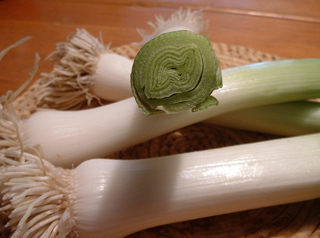 Add the leeks and 1/4 cup of water, cover, and cook 15 minutes, stirring once in a while; check to make certain that the leeks do not brown (if they start to take on any color, lower the heat to medium-low). Uncover, season with ½ teaspoon of the salt and the pepper, add 1/2 cup of water, and cover again; cook 10 more minutes. Add the cream and Parmigiano, bring to a boil, uncovered, and cook 1 minute, or until the sauce reduces enough to coat the back of a spoon. Meanwhile, bring 5 quarts of water to a boil. Add the garganelli and the remaining 2 tablespoons salt; cook until al dente. Drain, reserving 1/2 cup of the pasta cooking water. You can add 1/2 cup of pitted and chopped black olives to the sauce for a deeper, saltier flavor; be sure to buy olives at an Italian or specialty foods market and avoid canned olives, which have a tinny, flat taste. Gaeta olives work especially well in this recipe. Line an 11-inch x 17-inch baking sheet with aluminum foil; place the peppers on it, cut side down, and broil in the preheated oven until they are blistered and black, about 15 minutes. Remove from the oven; wrap in the aluminum foil that lined the baking sheet and set aside for 15 to 30 minutes; the steam in the foil packet will loosen the skin of the peppers, making them easier to peel. Unwrap the peppers, then peel and remove the seeds; cut into strips (this can be done up to 4 days ahead and refrigerated). Heat 1 tablespoon of the olive oil in a 14-inch skillet over medium-high heat. Add the Pancetta, garlic, chili, and basil, and cook 5 minutes, or until the Pancetta is golden but not browned, stirring often. Fold in the tomatoes, roasted pepper strips, 1/2 teaspoon of the salt, and the pepper. Cook over medium heat 20 minutes, covered, stirring once in a while. Meanwhile, bring 5 quarts of water to a boil. Add the penne rigate and the remaining 2 tablespoons of salt. Cook until al dente, then drain, reserving 3/4 cup of the pasta cooking water. The key to a delicate sauce is not to brown the onions in the butter, but rather to cook them down gently until meltingly tender. Melt the butter in a 12-inch pan over medium heat. Add the onion and sauté until barely golden and quite soft, about 10 minutes. 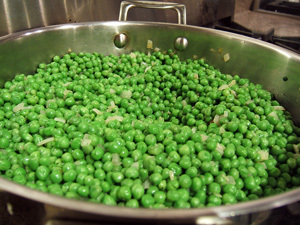 Add the peas and cook 10 more minutes, or until the peas lose their starchy texture and soften a bit. Pour in the broth and bring to a gentle boil; cook 10 more minutes, or until the peas are soft and the broth has evaporated. Stir in the Prosciutto and cook 1 minute. Add the cream; bring to a boil. Crumble in the saffron; stir to dissolve. Season with 1/2 teaspoon of the salt and the pepper, stir in the Parmigiano until melted, and cook 1 more minute. Keep warm. Meanwhile, bring 5 quarts of water to a boil. Add the fettuccine and salt and cook until al dente, about 2 minutes; drain, reserving 1/2 cup of the pasta cooking water. Toss the fettuccine with the sauce in the pan for 30 seconds to mingle the flavors, diluting with as much of the reserved pasta cooking water as needed to achieve a coating consistency. This is a very easy dish to put together: the sauce cooks in the time it takes the water for the pasta to come to a boil. Heat the olive oil in a 14-inch skillet over medium-high heat. Add the sausage and cook 5 minutes, or until browned all over, stirring often. Add the garlic, chili, and basil, and cook 30 seconds. Stir in the tomatoes, 1/2 teaspoon of the salt, and the pepper. Cook over medium heat 20 minutes, covered, stirring once in a while. Gorgonzola, a nutty, cow's milk cheese streaked with blue veins, is delicious both raw and cooked. This recipe, from my native region of Lombardy, was a favorite of mine when I was growing up... my mother often made it as a schoolday lunch. Bring 5 quarts of water to a boil. Add the rigatoni and salt and cook until al dente; drain. Meanwhile, melt the Gorgonzola with the heavy cream, butter, and 1/4 cup of the Parmigiano in a 1-quart pot set over medium heat, stirring constantly. Bring to a boil and reduce slightly, about 5 minutes. Always dissolve saffron in boiling liquids (in this case, the cream sauce) to extract the maximum color and aroma from it. 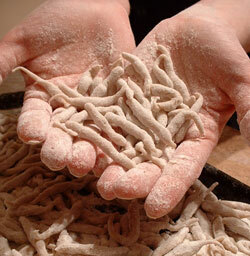 Gemelli are short, twirled pasta strands; penne rigate or fusilli are good substitutes. In a 14-inch skillet over medium-low heat, cook the shallot and garlic in the butter until golden and soft, about 5 minutes. Add the crabmeat, asparagus, and cherry tomatoes, and cook 5 minutes over medium heat. Add the cream; bring to a boil. Crumble in the saffron; stir to dissolve. Season with 1/2 teaspoon of the salt and the pepper, and cook 1 more minute. Meanwhile, bring 5 quarts of water to a boil. Add the gemelli and the remaining 2 tablespoons of salt, and cook until al dente; drain, reserving 1/2 cup of the pasta cooking water. Toss the gemelli with the sauce in the skillet for 30 seconds to mingle the flavors, diluting with as much of the reserved pasta cooking water as needed to achieve a coating consistency. The ravioli can be shaped up to 24 hours ahead and refrigerated, covered with a clean kitchen towel, or they can be frozen for up to 1 month; if you freeze the ravioli, do not defrost them before dropping them into the boiling water, but allow 1 extra minute for cooking. 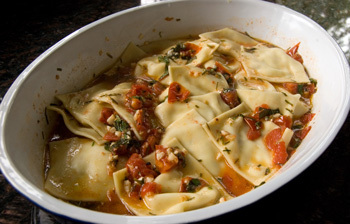 The raw ingredients for these delicious cheese-filled ravioli, and the accompanying sauce, are easy to find in most stores: Unbleached all-purpose flour and eggs for the dough; Ricotta, Mozzarella, Pecorino, black pepper, and nutmeg for the filling; tomatoes, olive oil, garlic, chives, and basil for the sauce. 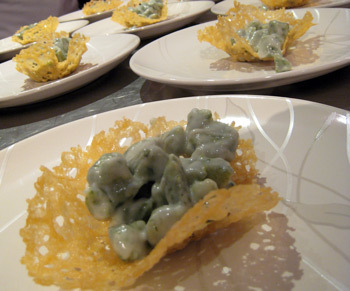 A bit of Pecorino is sprinkled on top of the ravioli when serving. Place the all-purpose flour on a counter and make a well in the center. Crack the egg right into the well. You can use a fork to beat the egg if you like, or simply use your fingertips like I do to mix the egg into a nice frothy mess. Then start drawing in the flour from the edges of the well, little by little, until the egg becomes a thick slurry. It will be a bit messy and may seem sticky at first, but as you draw in more flour, the dough will start to come together and form a shaggy mass. It will gather around your hands. 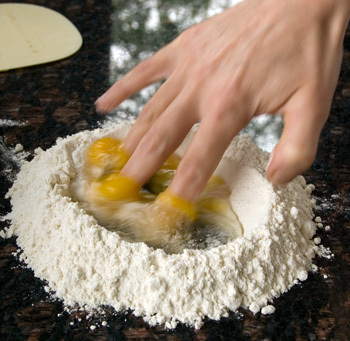 When almost all of the flour has been incorporated into the egg, begin kneading the dough by hand. The goal is to incorporate all the flour into the egg, so don't stop just when it seems the dough has come together; remember, this has to be a firm dough, so if it is sticky, it will be a problem later on. Begin to knead the dough with the palms and heels of your hands. If the dough is dry, add a touch of water; if it is moist, add a touch of flour. 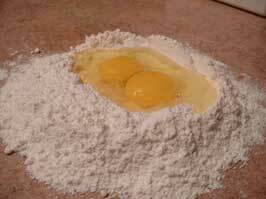 Alternately, place the flour in a bowl, make a well in the center, and add the egg to the well. Work the egg into the flour in the bowl, then turn the resulting dough out onto the counter and knead it as above; this method may be easier for beginners. Incorporate these bits into the dough while the dough is still in its initial stages; if you wait too long to incorporate these drier or shaggy bits, and you add them to a nearly finished dough, they will ruin the smooth texture you have already achieved in your dough. Knead the dough until it is smooth and supple with your hands; it will take about 5 to 10 minutes. Use all the strength you have in your hands; this is a rather firm dough, nothing like bread dough; it is quite dry, and needs to be pushed, compressed, turned so that the flour absorb the egg and the resulting dough becomes smooth and supple. The aim of kneading the dough is not to develop the gluten in the dough, as in bread-making, but rather to produce a dough that is homogenous and workable. This will take a few minutes of vigorous kneading. Some people like to use a food processor to knead the dough, as it makes the job easier and less strenuous (and faster of course). I do not; I prefer to feel the dough come together under my hands, and I believe you will have a suppler, more even dough when you use your hands to knead, rather than a machine. Your hands will tell you exactly what the dough needs: a touch more flour, a touch more water, more attention to a certain problem area rather than another. Also, cleaning a food processor and all its parts takes a lot longer than just scrubbing a countertop! The longer you knead the dough, the more lively it will feel, and the easier it will become to work. The dough will change from ragged and rough to smooth and elastic as you work it. You will know that the dough is ready and has been kneaded sufficiently when you see that it is all the same color and texture throughout. Most importantly, when you cut into the dough, you will notice that it looks striated and has many tiny air bubbles; these are a testament to the fact that the dough was folded over itself sufficiently and kneaded properly. The dough will look almost like it contains yeast and has started to rise (though of course it won't rise!) because you folded it over itself so many times during the kneading process. At this point, you can let the dough rest for about 30 minutes, covered with a towel, or you can roll it out immediately. I do not find that letting the dough rest makes a significant difference so I usually just skip this step. Letting the dough rest allows the gluten to relax, making stretching and rolling out the dough easier; but this is only a concern if you are using a rolling pin to roll out the dough by hand. Make the filling: In a bowl, combine all the ingredients until smooth. Taste for seasoning and adjust as needed. 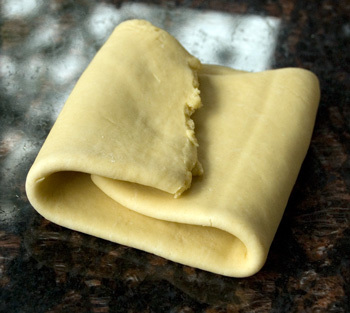 To roll out the dough, begin by flattening the dough into a thin rectangle, about 1/2-inch thick. It is important to shape this rectangle as neatly as possible so that when you roll out the dough into a lasagna sheet, there will be less waste at the edges. The straighter the edges, the better. Put the rectangle through the pasta machine with the setting at the lowest number; this corresponds to the widest setting on the rollers. Roll the dough through once. Fold the dough in thirds, into a neat letter shape. Roll the dough through the machine again, still at the widest setting, feeding it through with the open sides of the dough facing up and down (not sideways). It is very important to feed the dough through with the open sides facing up and down; the lasagna sheet will take on a strange, uneven shape if you feed the dough through in the other direction, with the open sides facing sideways rather than up and down. Repeat the rolling, folding into thirds, and rolling process twice more, still on the widest setting. This finishes kneading the dough and gives the dough great elasticity, making it easier to roll it out as thinly as you want later. Be sure to lightly dust the dough with flour each time you roll it through the machine, or the dough may stick and tear. After you have rolled the dough through folded over itself in thirds a total of three times, the dough should look smooth and even, and you should have a thin rectangle with a nice, rectangular shape. If the dough rectangle is ragged, bumpy, or uneven, repeat the folding and rolling process until it is smooth and even and nicely shaped. Now it is time to start rolling the dough out into ever thinner sheets. You will NOT be folding the dough over itself anymore after this point or it will tear. Roll the dough through once on each successive setting of the pasta machine, until you have a lasagna sheet so thin that you could read newsprint through it. This will yield very delicate ravioli. If the dough is rolled out too thick, the ravioli will be doughy. It is important to achieve a good balance between the thickness of the dough and the heft of the filling. Remember to lightly dust the dough with flour each time you roll it through the machine. Lightly flour the counter and place the lasagna sheet on it. Cut the sheet into two equal pieces. To do this, flip one side of the dough over the other to find the halfway point, press gently to mark the halfway point, and flip the dough back so the lasagna sheet is no longer folded. Use a pastry wheel to cut where the halfway point was. If the two sheets are uneven, reserve the wider sheet for the top, and use the thinner sheet for the bottom. Lightly brush the bottom sheet with water (you can also use some egg to do this if you like; egg yields a richer-tasting dough, water a lighter-tasting dough). Do not brush the top sheet with water. Using two spoons, place teaspoons of the filling along the bottom sheet. 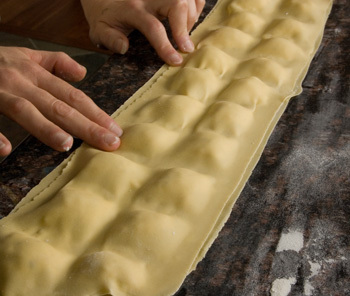 Be sure to work in neat rows and leave some space between, below, and above the rows of filling, as you will need to seal the dough later to create the ravioli. 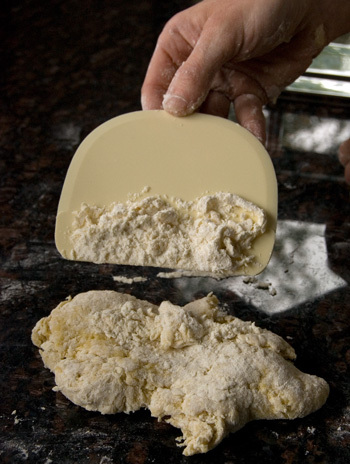 If the mounds of filling are placed too close together, or too close to the border of the dough, the dough will be unable to seal fully and your ravioli will lose their filling once boiled. 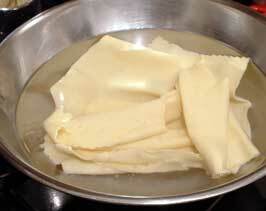 Drape the top sheet over the bottom sheet and press gently so it adheres, covering the mounds of filling entirely. Use your hands to remove the air pockets that have formed between the rows of filling. This step is very important, so take your time. 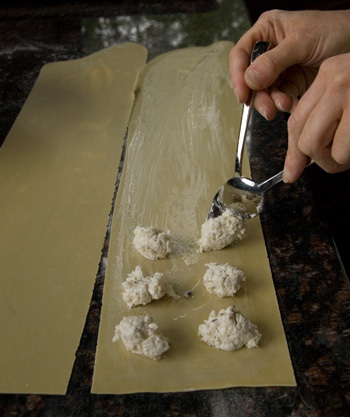 Before cutting into ravioli, make sure that the dough has not started to stick to the counter. If it has, you need to lift it, dust underneath with flour, and then lay it down on the floured counter before cutting. 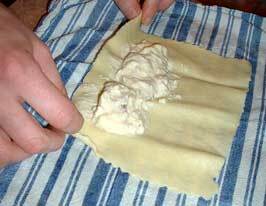 Using a pastry wheel (fluted or plain, as you wish), cut into even squares. These are the finished ravioli. Line a tray with parchment paper and dust lightly with flour. Arrange the ravioli on the parchment paper-lined tray in a single layer. If cooking the ravioli immediately, there is no need to cover with plastic wrap or a towel. If cooking later, cover the ravioli to prevent drying. The ravioli can be held at room temperature about 30 minutes or in the refrigerator up to 1 day (they can also be frozen if desired). Make the sauce: Place the olive oil, garlic, and chives in a large skillet over medium heat. Warm gently, until aromatic, about 30 seconds. Add the tomatoes, season with salt and pepper, and cover. Cook 15 minutes, adding a bit of water if needed to keep the tomatoes moist. The sauce can be made 2 days ahead and refrigerated until needed; just warm it through when you are ready to serve the ravioli. 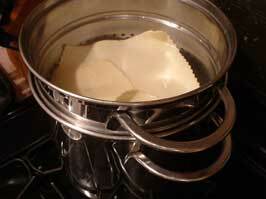 To cook the ravioli: Bring 2 quarts of water to a boil. Add the salt and drop in the ravioli. Cook 5 minutes, or until al dente. Drain very gently so the ravioli do not break, reserving 1/2 cup of the ravioli cooking water. Place the ravioli in a wide, shallow serving platter. Pick through the mussels, discarding any opened ones; mussels should be closed when they are raw, and open when they are cooked. 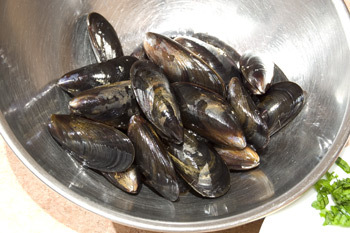 If mussels are gaping open before cooking, tap gently on a counter and see if they close; if they do close, they can be cooked (the closing action means they are alive and responsive) but if they remain open, discard them as they are likely dead. 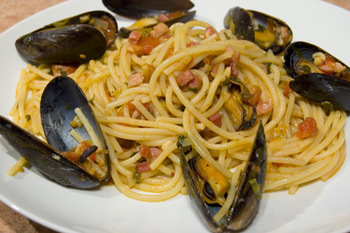 Place the closed mussels in a large bowl and pull off any beard with your fingers. Cover with cool water. Add 1/4 cup of the salt and set aside at room temperature to purge for 30 minutes; the salt will draw out any impurities from the mussels. Carefully remove the mussels from the salt water without disturbing the sediment at the bottom of the bowl and rinse the mussels repeatedly in a colander. Discard the salt water. Bring 5 quarts of water to a boil in a large pot. Cook the spaghetti with 2 tablespoons of the salt until al dente, about 8 minutes, stirring often; drain, reserving 2 cups of the pasta cooking water. 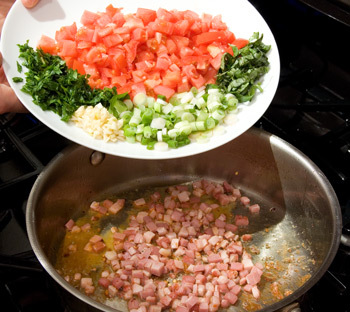 Meanwhile, place 2 tablespoons of the olive oil in a 14-inch skillet over medium-high heat, and add the Pancetta and chili flakes. 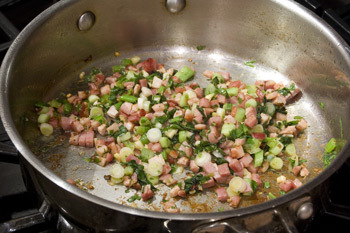 Cook 5 minutes, stirring often, or until the Pancetta browns lightly around the edges. Add the garlic, scallions, parsley, and basil to the skillet, and cook, stirring, for about 2 minutes, or just until the scallions soften and lose their raw scent. Do not cook too long at this point or the garlic may burn and give the finished sauce a bitter taste. You can replace 1 small minced yellow onion for the scallions and garlic, or you can add 1/4 cup of chopped pitted black olives (such as Gaeta or Taggiasche) to the skillet at this point. Alternately, if you are unable to find Pancetta at your market, use bacon instead (bacon is smoked, whereas Pancetta is not, therefore the latter has a more delicate taste and is more suitable for seafood sauces). Add the tomatoes and the remaining 1/4 teaspoon of the salt to the scallion mixture in the skillet and stir to incorporate. Cover with a lid and cook 5 minutes, or until the tomatoes start to break down into a sauce. The sauce will not be smooth, but rather, chunky. Add the mussels to the skillet and cover again with the lid. 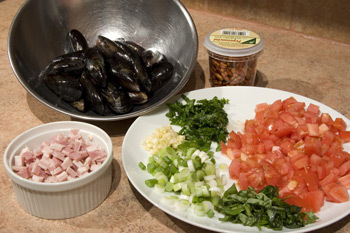 Cook until the mussels open, about 8 minutes, shaking the skillet once in a while. 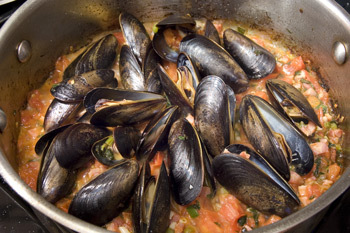 Remove the lid and discard any unopened mussels from the sauce; any mussels that fail to open in the skillet were surely dead before they hit the skillet and are unsafe to eat. 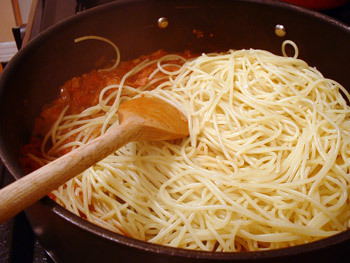 Toss the drained spaghetti with the sauce in the skillet and add as much of the reserved pasta cooking water as needed to achieve a fluid coating consistency. 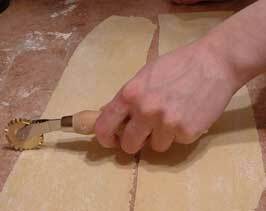 If you've always wanted to make fresh pasta dough but felt unsure of the correct technique, here's a primer to get you comfortable kneading, rolling out, and cooking your own fresh pasta. Or, as below, it can be boiled and sauced simply with room-temperature basil pesto to make an authentic Ligurian specialty: Lasagne al Pesto Ligurian-Style. So if you thought making fresh pasta was difficult and lasagna had to be baked--you're in for a double surprise! 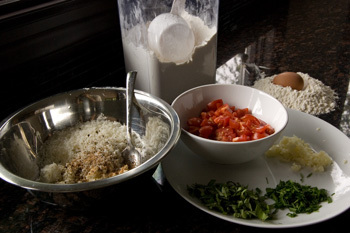 The raw ingredients for fresh egg lasagna are: Unbleached all-purpose flour; sea salt; and eggs. 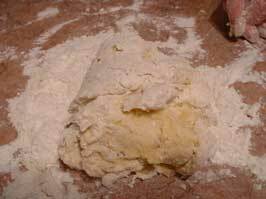 The standard formula used by most Italian cooks is 3 and 1/2 ounces of flour per egg. However, some recipes call for more or less eggs; no eggs at all; only egg yolks; a hint of white wine; or olive oil to be added to the dough instead. All of these variations yield different lasagna; the fun is in experimenting once you have mastered the basic technique of combining wet and dry ingredients and rolling out and cutting the resulting dough. Place the flour on a counter and add the salt; combine with a fork. Make a well in the center and add the eggs to the well. 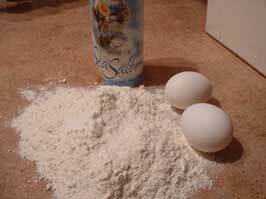 Using a fork at first, draw the flour into the eggs. When almost all of the flour has been incorporated into the eggs, begin kneading the dough by hand. Alternately, place the flour in a bowl, mix it with the salt, and stir in the eggs, then turn the resulting dough out onto the counter and knead it as above; this method is easier for beginners. The aim is not to develop the gluten in the dough, as in bread-making, but rather to produce a dough that is homogenous and workable. 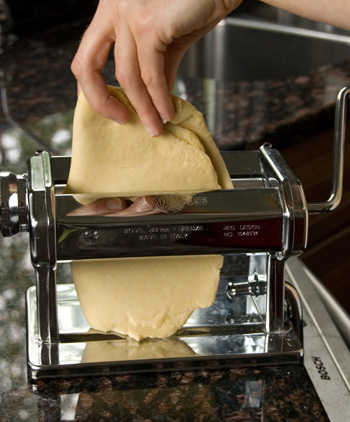 To roll out and cut using a pasta machine: Cut the dough into 4 equal pieces, keeping the other pieces of dough covered to prevent them from drying out and forming a skin. Working with 1 piece at a time and keeping the others covered, dust 1 piece with flour, shape it into a flat rectangle, and roll through the machine set on the widest setting. Fold the resulting sheet in thirds, dust with flour, and roll through the machine on the same setting. Repeat one more time, folding the sheet over itself, dusting with flour, and rolling through on the same setting. You will have rolled the rectagle through three times on the widest setting. Switch to the next-thinner setting; dust the sheet with flour and roll through the machine, without folding the sheet over itself. Repeat the process until you reach the second-to-thinnest setting on your pasta machine. 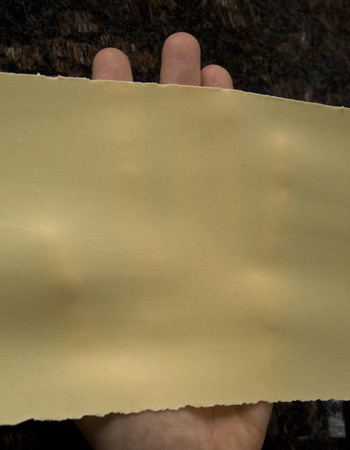 The sheet should be thin enough to be nearly transparent; if needed, roll through on the thinnest setting to obtain a sheet that is sufficiently thin. The thinner the lasagna sheets, the better they will taste. It is very important that you remember to dust the sheets with flour before rolling through the machine, or they may stick or tear. Repeat with the remaining 3 pieces of dough. When you have rolled out all of the dough, lay the resulting lasagna sheets out on a lightly floured counter and cut into squares using a fluted pastry wheel. This is the lasagna. It is now ready to boil and top with the pesto (see below, Step 10). You can also sauce the lasagna with tomato sauce, a seafood sauce, or a light white-meat ragu--in short, any sauce that is light yet flavorful, preferably not cream-based. To dry lasagna and reserve it for future use, lay the squares out on a lightly floured counter in a single layer until thoroughly dry, then stack in an airtight container at room temperature up to 2 weeks. To freeze lasagna, lay the squares out on lightly floured trays in a single layer and freeze until solid; wrap in wax paper and then in a double thickness of freezer-safe plastic bags. When you are ready to cook frozen lasagna, drop directly into boiling water without defrosting first. Frozen lasagna keeps up to 1 month. To turn your fresh lasagna into cannelloni, see above. To turn your fresh lasagna into oven-baked lasagna, see the recipe for Vincisgrassi (a truffled lasagna from the Marches) in my cookbook, RUSTICO: REGIONAL ITALIAN COUNTRY COOKING. 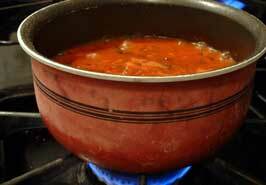 To cook the lasagna, bring a large pot of water to a boil (allow 4 quarts of water for 4 servings). Add a generous dose of salt and drop in 4 lasagna squares at a time. Cook until al dente, about 1 minute, then remove with a slotted spoon to serving bowls. Toss each serving of lasagna with room-temperature pesto (see Step 10) as you remove the lasagna from the boiling water, or it will stick together. Continue to cook and sauce the remaining lasagna in the same manner. Serve the lasagna immediately--do not wait for all servings to be cooked or the lasagna will cool down. To make Lasagne al Pesto the traditional Ligurian way, prepare a basil pesto. Make sure the pesto is at room temperature before serving. Cannelloni are an ideal choice for dinner parties, since they can be assembled up to 12 hours before baking and refrigerated. When your guests arrive, simply pop them in the oven for 30 minutes and enjoy! Heat the olive oil in an 8-inch sauté pan over a medium flame. Add the onion, garlic, and basil, and cook for 5 minutes over medium heat, stirring often. Stir in the tomatoes, salt, and pepper; bring to a boil, and cook for 30 minutes over medium-low heat, covered. Taste for salt and adjust if needed. The tomato sauce can be made up to 5 days ahead and refrigerated; it can also be frozen for up to 2 months. For the cannelloni, you will need eight 5-inch lasagna squares. 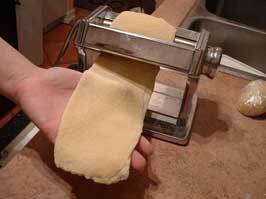 You can cut fresh lasagna sheets with a fluted pastry wheel for a prettier presentation (see Step 9 below). To cook the lasagna squares, bring 5 quarts of water to a boil. Add 2 tablespoons of salt. Drop in 4 of the lasagna squares and cook for 2 minutes, or until al dente. Remove the lasagna squares to a bowl of cool water with a slotted spoon. Blot the cooked lasagna squares dry on kitchen towels. Cook the remaining 4 lasagna squares the same way and blot dry as above. Divide the Ricotta filling evenly among the lasagna squares. 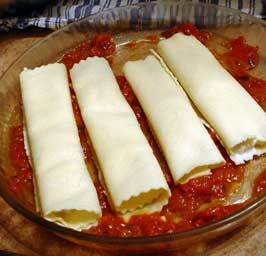 Shape the filling into a log along the bottom of each lasagna square and roll into tight bundles. 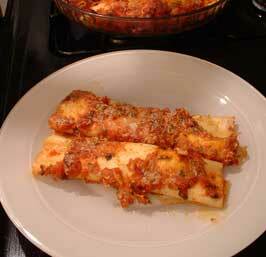 These are the cannelloni. Spread 1/2 cup of the tomato sauce in a baking dish. Arrange the cennelloni in a single layer, seam side down, in the prepared baking dish. Top with the remaining tomato sauce and sprinkle with 1/2 cup of freshly grated Parmigiano Reggiano. Bake in a preheated 400 degree oven for 30 minutes. If the sauce dries out during baking, cover the baking dish loosely with aluminum foil. One of the cardinal rules of pasta cookery is to NEVER rinse cooked pasta once you've drained it. Why? Because rinsing pasta would strip it of some of its lovely starchy outer coat, which in turn would make it slippery rather than velvety and would lessen its ability to cling to sauce. The starch on the pasta is essential for the proper binding of sauce to pasta. First of all, start with a big pot. None of those squat pans, and no need for nonstick unless you happen to have only a nonstick stockpot. Bring 4 cups of water to a boil for every 3 and 1/2 ounces of pasta you intend to cook. The water should be at a rolling boil when you add the pasta. Add about 1 tablespoon of salt per quart of water when the water comes to a boil (if you add it earlier, it will simply make the water come to a boil more slowly). Add the pasta all at once, and stir with a long-handled tool. If you are making long pasta, keep stirring until it becomes supple, loses rigidity, and is entirely submerged in the water. Stir the pasta every minute or so. This is crucial to prevent sticking and to ensure even cooking. Your pasta is now ready to toss with sauce in a heated bowl or large skillet... Buon appetito!